Through Twitter I learned that today, July 10, is Natto Day. I’ve mentioned before that I’m not a fan of natto, but I’d like to incorporate the sticky fermented bean into my diet because it’s healthy. So I figured that Natto Day would be the best day to begin The Great Natto Experiment. Based on suggestions from Facebook friends, I’m going to try different ways of eating natto so that I can acquire the taste. To begin the experiment, I decided simple was best. 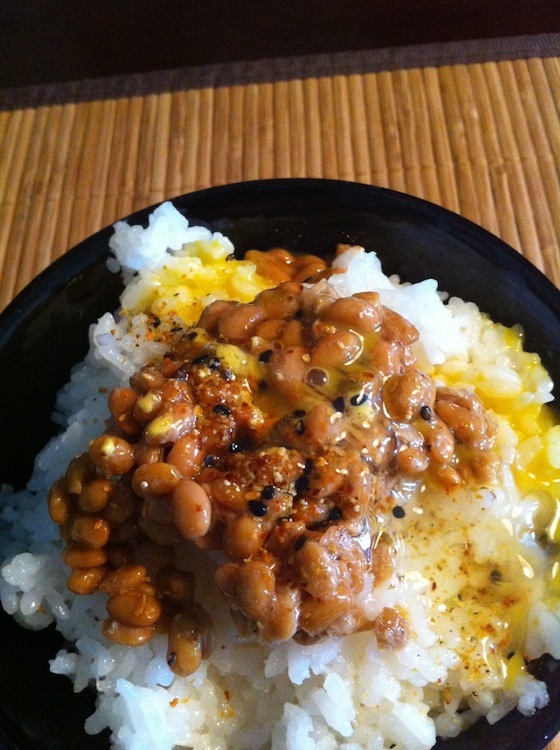 The Great Natto Experiment: Natto over rice with shichimi, karashi, and raw egg. The Verdict: Eh. While I admit that natto tastes better with egg and shichimi, I’m still not convinced I can eat this every morning for breakfast. I gave it the ol’ college try, but I simply couldn’t finish it. Perhaps I’m thinking about NOT liking it, which prevents me from actually liking it. The Plan: Try again, using another tip!